THE WRITING BUDDHA - Opinions | Books | Movies: Eleven Gods And A Billion Indians by Boria Majumdar (Book Review: 4.25*/5) !!! Eleven Gods And A Billion Indians by Boria Majumdar (Book Review: 4.25*/5) !!! If you talk about Indians, anything that keeps everyone united are Cricket, Politics and Bollywood. And when it comes to Cricket, there is nothing that fascinates us anymore. Being a reader and a fan of Cricket, whenever I get to know that there’s a new book released on Cricket, I cannot stop myself in assuring that I get to read the book somehow. Last weekend I got my hands upon the book named “Eleven Gods And A Billion Indians” written by none other than the Cricket Expert and Scholar, Boria Majumdar, who is also known for assisting Sachin Tendulkar in writing his autobiography. The tagline of the book says “The On and Off the field story of Cricket in India and Beyond”. Writing a book about the on-field happening is easy if you pick only the performances to discuss but it becomes very difficult and controversial when you decide to speak truth about few controversies that happened on the field. More over that, very few authors have enough knowledge to speak about the off-field events and those who know does not want to disclose the secrets behind the game and board that handled the game. Boria Majumdar has showed enough character in writing a book on such a topic and the way he has executed it is a level above all the other books written in such genre on specifically, Cricket. The book starts with the most controversial subject on match-fixing and since then it is unstoppable as the author discusses on almost everything that has been a big question to us in all these years of our devotion such as how Indians started performing overseas, the controversy of Greg Chappell-Ganguly, Harbhajan-Symonds, the most recent one- Virat Kohli-Anil Kumble etc. 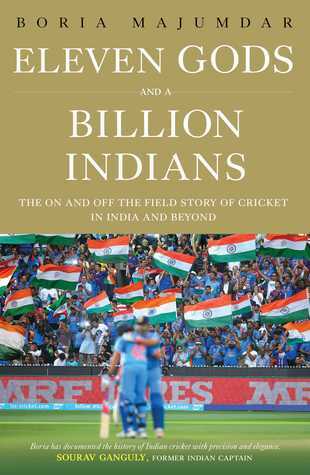 Author then also discusses how Cricket earned initially when the television sets had come in India and how it has transformed itself into a mega-event where 20,000 crores are being shelved out for the five years of IPL rights. The BCCI and its stand on various issues are discussed so openly that I doubt anyone else would have spoken about this board so directly and specifically with directly taking names. The India’s win of both- 1983 and 2011 is also covered descriptively which will make you feel as if you are watching the match live. The Part Four of the book discusses Ranji trophy specifically and the initial days of Cricket craze in our country. The Part Five is all about Virat Kohli and the current set of Cricketers and what we are looking ahead through them for this sports and the expectations that they have on their shoulders to fulfill. The Women Cricket Team is also discussed in the last chapter making it sure that they are also the future of Cricket in India considering their performance in the last World Cup where they reached Finale and ended up being Runner-Up. Sachin Tendulkar’s career is also discussed along with his last Test match which again makes you shed tears. Reading this book, I was surprised and shocked to read various truth about the sport and wanted to hug Mr. Majumdar for writing such a strong book and having debateful takes on each important event that has happened in the world of Indian Cricket. He has never been biased towards any party throughout the book and I want to specifically point out the chapter on Kohli-Kumble saga where he has spoken very neutrally and made it clear that it’s not only the current aggressive players like Virat Kohli who are always wrong but it can be legends like Anil Kumble too. No inner person working with Cricket could have written about such detailings about big names so honestly. This book will always be named in one of the top books on Cricket. Kudos to Boria Majumdar. I give this book 4.25* out of 5.